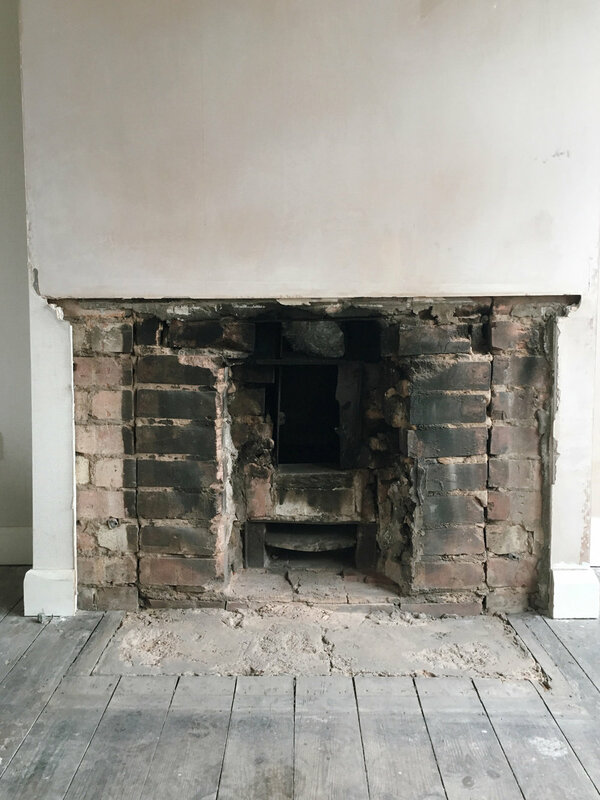 “Wouldn’t it be nice to get a woodburner installed in time for Christmas?” I said longingly to Mr P one evening a few weeks ago as renovation fatigue set in and the first signs of an autumnal chill started to bite in our currently drafty, dusty and dilapidated living room. We didn’t really have the space for a woodburner in our old house, or a chimney, so we never really seriously considered it, but here in the new house we already have a working fireplace that was in use until fairly recently, or at least we did have until we ripped it out a few weeks ago (check out my IG stories highlights if you missed it), so now it’s something that’s definitely top of our wishlist. This is what the original 1930s fireplace looked like when we moved in. It had a certain art deco charm about it and we did initially wonder whether we might be able to keep it and restore it. It seemed a shame to rip out something that had survived more or less intact for so long, but several of the tiles were quite badly damaged. We looked into trying to repair or replace them, but I think it would have been tricky and we would probably have ended up with something that we weren’t completely happy with. Plus of course, we would have needed to get the chimney checked over, swept and possibly relined to make sure it was safe and when we started adding up the costs it didn’t really seem worth it. Anyway we’ve both always really wanted a woodburner. So we ripped out the old fireplace and now it looks like this. Some people on Instagram were horrified, but it takes us a step nearer to creating the space we want. Now every time I look at it rather than thinking about what a mess it is I think about how lovely it will feel when it’s all finally finished and we can cosy up in front of the woodburner. We’ve been living in the house throughout the renovations and one thing I can tell you is that I feel a lot less sentimental about the original period features now than I did when we first moved in. We don’t want the house to look like a bland new build, but we do want to find our own way of creating a home that has character and soul, rather than feeling that we have to keep all the features that were originally here. The house has to work for us, and the old fireplace just didn’t really. Our other plans for the room include knocking through the rear wall (where there’s currently just a window) and installing crittall style doors that will lead out into the garden. The old floorboards will come up and we’ll fit pale oak parquet in their place and for lighting I have my eye on this bronze and opal glass pendant by & Tradition. You can check out my moodboard for the room over on Pinterest if you’re interested. So where to start with choosing a woodburner? I have to confess that I didn’t really know much about them until we started looking into it a few weeks ago. 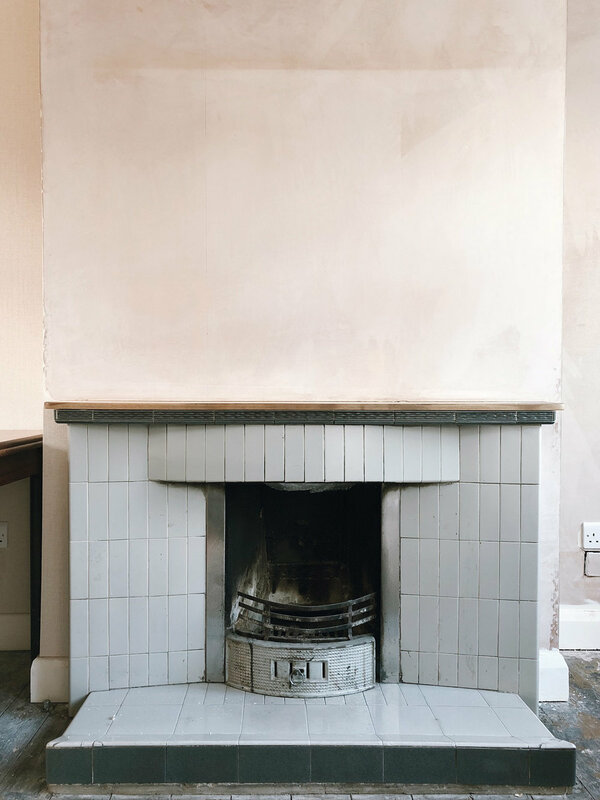 Kate at Mad About the House wrote a great post here with lots of useful information after she had a stove installed recently, and I also asked some of my Instagram followers for their recommendations. Lots of you were really helpful in sharing advice and I’ve also spoken to a few suppliers and installers so I’m feeling a little more clued up now. Obviously there’s lots of technical stuff you need to consider regarding the safety and efficiency of your stove and the flue. Your installer will be able to advise you on this - make sure you choose one who is HETAS registered. You can search for a list of registered installers in your area here. Environmental considerations are a key factor too. Old stoves and open fires can have relatively high emissions which affects the air quality, both within our homes and within our towns and cities. A new European wide law that aims to lower emissions and improve air quality is being brought into effect from 2022. Some suppliers are already making sure their stoves meet these new regulations so if you’re thinking of installing a new stove it’s worth checking that it will meet future regulations as well as satisfying current guidelines. I spoke to Arada who advised that they are already ensuring that their new products will satisfy the new legislation. Their entire Farringdon range is Ecodesign Ready and designed to be as clean burning as possible, producing much lower emissions than an old style stove or open fire. You’ll also need to consider what size stove you need to heat your home. Our living room is just over 20 square metres so we’ve been told that a stove with a heat output of 5kW should be fine. Obviously if you are installing your stove in a larger space then you’ll need one with a higher output. So now it’s decision time. All stove images courtesy of Arada.